The Nissan Frontier is the marketing name for the D22 and D40 generations of Nissan pickup trucks sold in the Americas and the Philippines. The D22 series was a compact pickup truck that began production in 1997 as a replacement to Nissan’s D21, commonly known as the Nissan Hardbody truck. Production of the D22 ended in 2004 and was replaced by the D40 series, which Nissan classifies as a midsize pickup. The D40 series of the Nissan frontier is still in production as of 2015. The 2009 Nissan Frontier is priced extremely competitively, with prices that are routinely below $20k even for low mileage vehicles. Most truck buyers want a model that is useful off-road as it is in the city. No truck can do everything, but the 2009 Nissan Frontier has good all-round utility for a midsize pickup. The Frontier’s closest competitor is the Toyota Tacoma, although the Frontier’s interior is more functional and has better on-road handling. The Frontier is available with many combinations of bed sizes, body styles and trim levels. Most buyers can find a configuration that meets their needs, whether it’s weekend off-roading, hauling the family or commuting to work. The Frontier also has a range of useful features and plenty of power for off-roading, although it has a simple interior and confusing options structure. The 2009 Nissan Frontier is available with a Crew cab and King cab, also known as an extended cab. The Crew cab has two doors and a standard 5-foot bed with the option for a 6-foot bed. The King cab has four doors and is only available with a 6-foot bed. The XE is the entry-level trim for the frontier, with more expensive trim levels, including the SE, LE and PRO-4X trims in that order. Each trim level includes all of the features of the trim below it, along with additional amenities. The basic XE trim is only available with a King cab, manual transmission and a four-cylinder engine. The amenities include cloth upholstery, bucket seats in the front and 15-inch wheels. The XE preferred package adds air-conditioning and an AM/FM/CD sound system. 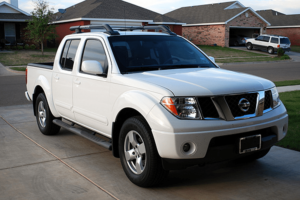 The engine options for the 2009 Nissan Frontier are a 2.5-liter I4 and a 4.0-liter V6, both gasoline engines. The V4 engine generates 152 horsepower (hp) and 171 pound-feet (lb-ft) of torque. A manual 5-speed transmission is standard, although the SE has an option for a 5-speed automatic. The fuel economy for the V4 engine is 17 miles per gallon (mpg) in the city and 22 mpg on the highway, assuming an automatic transmission. This engine is only available on the King Cab models. The 4.0-liter V6 engine generates 261 hp and 281 lb-ft of torque. It’s the only engine available for 4-wheel drive versions and the Crew Cabs. The configuration with the highest towing capacity is the King Cab 4×2 V6, which is rated at 6,500 pounds. It may have a 5-speed automatic or 6-speed manual transmission, depending on configuration and trim level. The V6 engine gets 14 mpg in the city and 19 mpg on the highway with automatic transmission. The Nissan Frontier received a facelift for the 2009 model year. The most noticeable change is the standard 6-spoke 17-inch alloy wheels, with an option for 18-inch alloy wheels. This model also has minor changes to the hood and headlights. For example, the front grille is less pronounced and the front bumper projects three inches further forward. The interior has also been improved for 2009, including softer upholstery for the higher trim levels. Revised interior features include the center console, door trim, fascia and instrument layout. The entertainment center has also been upgraded with Bluetooth connectivity for the CD, MP3 compatibility and speed-sensing volume. Additional interior upgrades include computer controls on the steering wheel, external temperature gauges, a trip computer and variable-speed windshield wipers. 2009 models with a V6 engine also gain side-curtain and side-impact airbags in addition to the dual-front airbags that were already standard features in 2008. ← The Trail Ready Beadlock Wheel – Is It The Best on the Market?